As the media arm for the US Council of Catholic Bishops and its newly red hatted head, Cardinal Timothy Dolan, the Fox News channel has provided almost total support for the bishop's opposition to the HHS contraceptive mandate. The "opinion" on Fox & Friends, as articulated by Fox host and NY Diocesan litigator, Peter Johnson, Jr., has been a point by point recitation of the bishop's talking points. Megyn Kelly's official "news" has also been, for the most part, with the bishops and reinforced by two visits from self-proclaimed Catholic spokesman and blowhard bigot, Bill Donohue. And to give the bishop's position that extra special Catholic imprimatur, Fox has employed its only official clergyperson, Catholic Fr. Jonathan Morris, who has pledged to die in support of the right of the Catholic Church and its pals in the GOP, to devote two of his regular Fox & Friends Sunday sermons about how this isn't about birth control but religious liberty. Fr. Morris, who went on Roman holiday as part of Cardinal Dolan's entourage, is a loyal foot soldier in the army of world oldest all men's club. As such, he took Dolan's message, about this "assault on religious liberty" to his Fox flock on this morning's Fox & Friends. Using the trademark Fox "battle" language (so popular in scripture), Clayton Morris reported that Cardinal Dolan is "ramping up his rhetoric in the ongoing battle over that contraceptive mandate." Framing the "controversy" and doing a little Catholic community organizing, the agitprop chyron read "Contraception Controversy, Dolan Urges Catholics to Fight HHS Mandate." He played video of Dolan yelling "whose trying to impose what on who. We're not trying to impose our teaching on anybody." (Really?) Alysin Camerota asked "will Catholics be willing to settle?" After Dave Briggs noted that Dolan's "bold" statement shows that he is "unhappy" (awww), Morris explained why the "compromise," of requiring insurers to pay for the birth control, is wrong. More Catholic advocacy with this chyron: "Dolan Calls on Catholics, Urges Worshippers to Get Involved in Politics." Morris was getting a trifle hissy when he described it as "an accounting trick." Clayton Morris said that the comment is "bold" because this is the "type of rhetoric" that we don't usually hear from Cardinals. Fr. Morris, wildly waving his jazz hands, shouted that "this is the first time that the federal government has chosen not to allow churches and religious organizations to be who they are." (The little padre is lying. The policy contains an exemption for churches and organizations that are religious in intent and who employ, solely, members of that faith.) The chyron reinforced Dolan's message to Catholics: "Contraception Debate, Dolan Calls Rule An Unprecedented Intrusion." Fr. Morris compared the birth control mandate to the federal government ordering Jews to work on the Sabbath. He was almost sputtering when he said that he would hope that the the Jewish population would fight this. (Funny, the mainstream American Jewish healthcare community has no problem with the mandate). He made the ludicrous assertion that the bishops "didn't start the fight." (Really?) The chyron reinforced the Fox/Catholic/GOP propaganda, "Freedom of Religion Battle." Alysin Camerota claimed that if 99% of American women use birth control, there isn't a problem with access and asked why we are "fixing it." Not mentioned is the unfairness of forcing non-Catholic employees, of large Catholic entities that receive federal monies, to pay for the birth control that secular women will get for free. Morris speculated that the government "has an agenda" (the bishops don't?) "to make Planned Parenthood very happy" as well as "the left wing and something else." He then mocked Sandra Fluke and said that "you can get if for free, so many places." He asserted that "somebody in the White House wants to fight this specific battle." 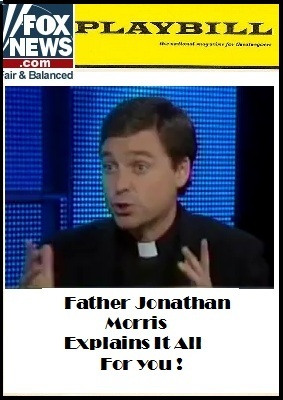 Father Morris got both the GOP and the bishop's message out to his Fox congregation. Roger Ailes and Timothy Dolan must be very happy for the services rendered. Father Spanky’s Bible obviously omits the commandment against bearing false witness. This is confusing:should we defer to the Pope to make our policy decisions even though a minority of Americans are RC. ? The Catholic Church practices a form of Child Theft with it’s school system. Children are indoctrinated to support a foreign power, the Vatican. This has always been the purpose of the RCC. This is essentially RCC Stop Loss.